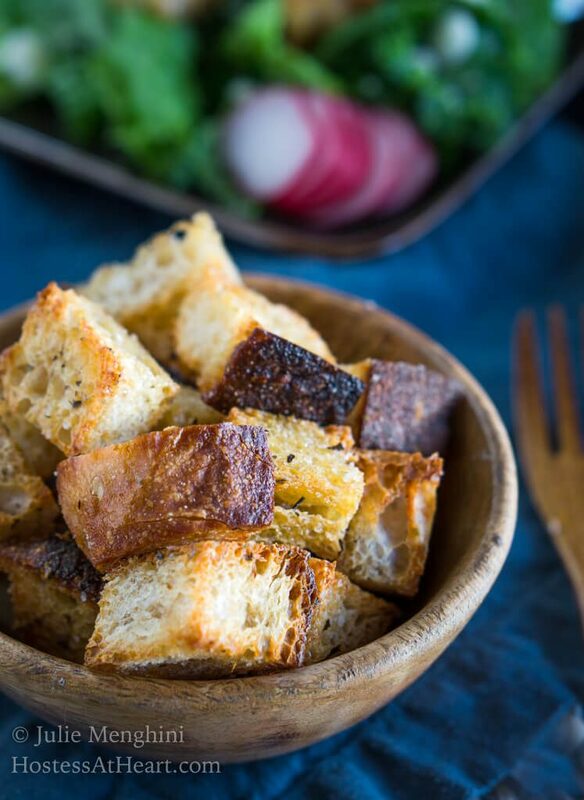 Homemade Bread Croutons are great on salads, in soup, or as a snack. It’s a great way to use up bread that would otherwise go to waste. I’ve been asked several times what I do with all of the leftover bread that I bake. 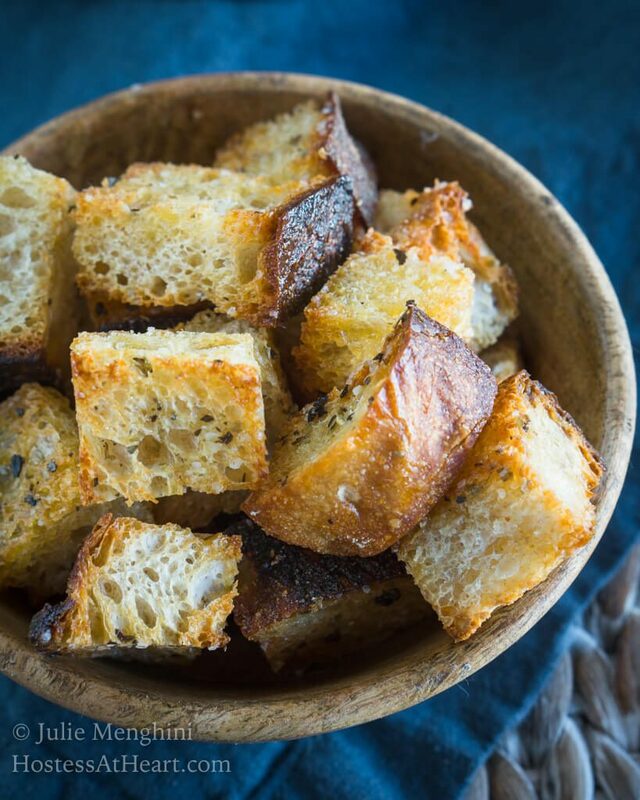 It’s simple, I make Homemade Bread Croutons. We put homemade bread croutons on salads, in soup or John (and my little neighbor kids) like eating them as a snack. They are so quick and easy, and the spices can be changed to your liking. You can sprinkle them with a healthy dose of parmesan cheese. I usually season them with an Italian spice blend or Herbs de Provence French herb blend. I also like that you can make them as large as you want and when you bite into them they’re not hard as a rock and taste like sawdust like some of the croutons you buy (not that I’ve ever eaten sawdust). There are weeks that we just don’t go through an entire loaf of bread. I will usually wrap up the bread and throw it in my freezer. When we are having salads or something else that we want a pile of croutons for, I will take the bread out of the freezer and just cut it into cubes. You don’t even have to let your bread thaw. Homemade Croutons are great on salads, in soup or just as a snack. They are a delicious way to use up bread that could go to waste. Preheat oven to 400 degrees F. Drizzle olive oil on a rimmed baking sheet. Place cubed bread in a large bowl. Lightly drizzle with olive oil and liberally add spices and sprinkle with salt. I will generally use an Italian herb blend or Herbs de Provence. Stir and repeat olive oil drizzle, herbs and salt. Spread bread cubes out on a prepared baking sheet. Bake for 13 to 15 minutes or until bread is browned and no longer soft. Cool and store in an airtight container for up to one week at room temperature. 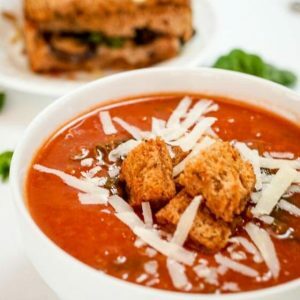 Another benefit of making your own croutons is that you choose the ingredients so you can assure that they are vegan, vegetarian, organic or fit into your food choices. Especially if you bake your own bread! Of course, leftover bread can always be saved for stuffing or dressing. I hope you will check out some of my bread recipes. 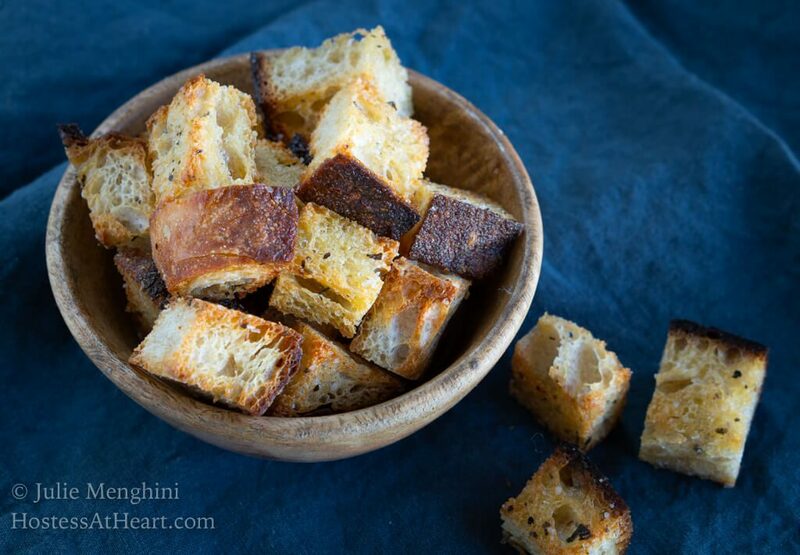 My Harvest Grains bread is a good choice and makes delicious croutons too. You’re going to want to whip up a batch of these recipes! I used to keep a big jar of these on the kitchen counter, they are so delicious and were a favorite snack of my family and my son’s friends. They would walk in the door and head straight for the jar, emerging with a handful as if they were popcorn. 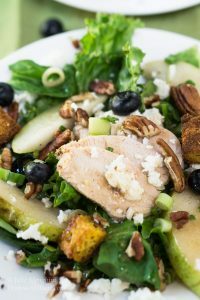 I love the crunch they add to salads and soups as well. That would have been a great idea putting them in a jar Liz. I know my kids would have kept that jar empty as well. John does a good job of it as well. Better than chips I say. What an useful post Julie! Thanks for sharing. Thank you Su! I appreciate you stopping by! Homemade croutons sound wonderful, Julie! I must be such a huge difference between homemade and store bought. I can’t even imagine how good they must be with homemade bread! Thanks so much for this! Thank you Shari! They are yummy and a few automatically disappear before I can get them stored away. I absolutely despise boxed croutons and love making my own! I’m sure they’re even better with the home-made bread! Thank you! Always so wonderful to have you stop by! I imagine you could eat these like pretzels, they look so good 🙂 You HAVE been busy in your kitchen Julie? 🙂 Happy weekend to you! My son was home last week so I was cooking a ton but not for the blog so this week I worked on it a bit. Loving the fresh produce Loretta. It inspires me to do different things with it. Enjoy your day sweet friend! Thank you, Julie, for sharing your recipe for croutons. Happy Fiesta! Thank you Ahila! Very kind of you to co-host! Great idea to use the toaster! Quick and easy not lazy. I love FF and thank you for stopping by! That’s great Anna! I’d love a few of those beautiful eggs boiled up on a good salad too! That’s the way I grew up too Ana. We used what we grew and were very creative on how many ways it could be used. My grandmother even made ketchup from choke cherries once. It was groooossss!! I’m afraid my ratio of crouton to salad would be unbalanced with these yummy croutons. I love bread in almost any form. I’m not saying that a few croutons didn’t make it to the picture either. These look perfectly crunchy, and I imagine that they have such a depth of flavor that ‘ordinary’ croutons would be lacking. Great,useful recipe Julie. Thank you Jess! They are a little addicting and so easy to make! Have a great weekend Jess! Thank you Megan! They are really and my little neighbor kids love helping me make them. One of them asked their mothers if they would ask me for the recipe. So cute! There is nothing better than home made croutons Julie. I liked the idea of freezing the leftover bread slices. Thank you Sonal! The little ones like helping make these two. Thank you Elaine! First I thought it was a no-brainer but I look up my time and temp every time I make them so thought may as well put it on the blog. Really?? Cool! Thank you I use yours too! Here’s one of those simple posts that all your readers will love, me included! Thank you Johanne. I agree. It’s so easy but I have to look at my notes every time I make them. Now I can just jump onto the blog. Enjoy your weekend!